Without question, the most important facet of golf is putting. Name another club you are GUARANTEED to use at least once every hole? (Yes, occasionally you may chip one in, and please don’t even think about the other option which would excuse you from putting, its bad luck!) So when you visit the driving range and blast 100+ balls, how do you practice putting? Sure, you could drop some balls at our awesome practice greens and work on your 12 footers. But how does that prepare you mentally for reading greens? How does that exercise your creativity for those double breakers out at Sydney Marovitz? It doesn’t. Enter Mini Golf. If you can conquer a nasty, 40 foot, double breaking, high-banking, dogleg right putt, you can take on anything a regular golf course has to offer. 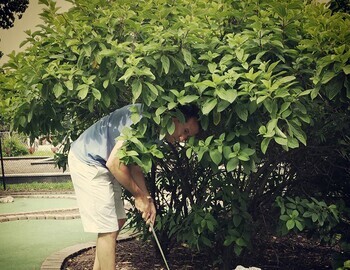 So next time you hit a large bucket at Diversey, don’t forget to stop by the Mini Golf and really put some work in. And don’t worry, we are putting work in as well, repairing some sections of the course!